A website host has removed online sites promoting a school shooting video game that was protested by parents of slain children. Acid Software says its two websites for the "Active Shooter" game were shut down Tuesday night by Bluehost, the Burlington, Massachusetts, company that hosted them. Acid says it's working to get the sites back up. Bluehost was urged to remove the sites in an online petition organized by Sandy Hook Promise, an anti-gun violence group formed by parents whose children were killed at Sandy Hook Elementary School in Newtown, Connecticut, in December 2012. The game allows players to participate in simulated school shootings. It recently was removed from the webpages of two online platforms after complaints by parents of children killed in the Newtown and Parkland, Florida, school shootings. The developer of a school-shooting video game is defending the product and vowing to continue selling it online as parents of slain children and other mass shooting victims work to get the game wiped off the internet. 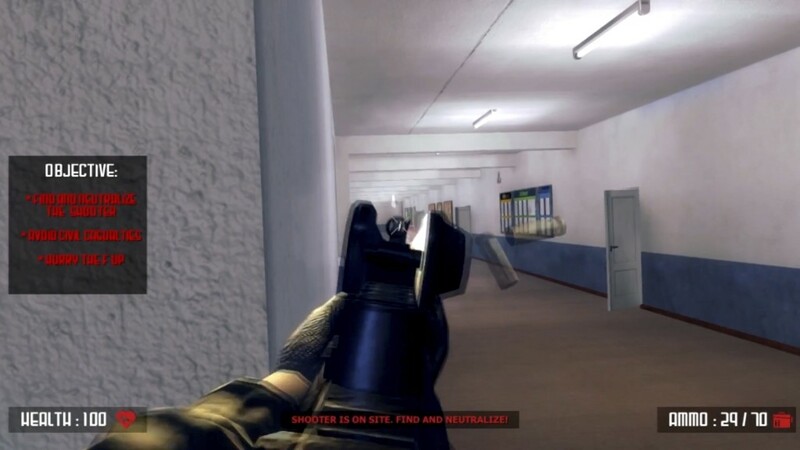 Acid Software recently set up two websites for the "Active Shooter" game after it was removed from the webpages of video game marketplace Steam and crowdfunding site Indiegogo. The game allows players to participate in simulated school shootings. The removals followed complaints by anti-gun violence advocates including parents of children killed in school shootings in Parkland, Florida, and Newtown, Connecticut. Acid said on Twitter it would not be censored and cited free expression rights. The new sites were not working Wednesday and it wasn't clear why. Representatives of Acid and the company hosting the new websites did not return messages.